Interests - Swimming, Cub Scouts, reading and having fun! Ethan was diagnosed with Cystic Fibrosis just before his first birthday after recurrent chest infections. Ethan was a very ‘floppy’ baby who at times would only lie around, was not interested in toys or his surroundings and did not have the energy to crawl. Ethan’s first admission into hospital was on Christmas Eve when he was six months old, where it was thought he had Bronchitis. From then on it was fortunate that he was referred to the local paediatrician, who then made the diagnosis after several sweat tests came back inconclusive. Once diagnosis was made and he started treatment his life improved considerably. Ethan has since had a further three hospital admissions for IV treatment and a bronchoscopy. Ethan’s daily routine consists of 40 tablets, nebulisers, inhalers and physio twice a day. Ethan attends main stream school and despite having to have medication during the day he enjoys his school life to the full. It is with sadness that I’m moving Ethan on from Post Pals but hopefully people who sent post to Ethan can send to another child who would appreciate it too. He has loved everything he received and we will try and send post to other children. Ethan has had a tough few months; he has had over a month of antibiotics due to a persistent chesty cough. Fortunately this did not result in a hospital stay but it was on the cards if the oral antibiotics didn’t work. Ethan has been out on the trampoline during the lovely sunny days to help clear his mucus and fingers crossed now that the weather has improved he will continue to stay well. Ethan has not let his infection get him down and is now a member of his schools hockey team – to go with the athletics and cross country teams. Also, Ethan has been practicing for a local basketball team and hopefully will be made a member of the team in a few weeks time. Ethan has been quite poorly this last month; he had a chest infection, a slight bowel blockage and was not gaining weight. At his last clinic appointment his right lung was very quiet, which the doctors didn’t like much, so his physio therapy was increased. We feared hospital was on the cards but with intense physio, lots of antibiotics, and some new weight gain supplements, Ethan has improved and this Christmas will be hospital free. Fingers crossed. Ethan is very much looking forward to Christmas and has some presents under the tree already from Post Pals. Thank you ever so much for all that you do for him. Ethan has been keeping well, up until a week or so ago. He is coughing a lot and is very tired – a course of antibiotics has his name on before the end of the month. Hopefully we can escape going into hospital. Ethan didn’t manage to hit his target weight, but didn’t loose anything either, so the doctors are now hoping he will improve by his next clinic appointment in November. Ethan has received some lovely cards and letters and still looks forward to seeing the post when he comes home from school. Many thanks to everyone who takes the time to send Ethan some mail. Ethan loved the story that was written over a few letters so many thanks for that and he loved the parcel he got with toys, pens and sand art in it. Ethan has kept fairly well over the last couple of months and has not needed any extra antibiotics. However his weight still seems to be a problem, he has now got a target to get to by next month. We are not certain what will happen if he doesn’t reach this target, but we are feeding him up in the best way we can. Ethan has been receiving lots of lovely letters this month and he would like to thank everyone who sent him some post for his birthday – the room was covered with cards!! Well, after having a good couple of months, Ethan has had a course of antibiotics, a bowel blockage and been tested for diabetes (still waiting on the results for that). Ethan has not reacted very well to the hot days as he is on an antibiotic that makes him sensitive to sunlight. He also forgets he needs to drink a lot in the hot weather hence the bowel blockage. Fortunately, things now seem to be moving along nicely after a tense week. Ethan was tested for diabetes late this month so we don’t have the results yet. That was a very tiring time for him as he hates needles and having blood taken every half hour from his canula was a terrifying experience for him. After a little while though he settled into it and he let the nurses have his arm without any moaning. There are no scheduled appointments this month so hopefully it will be a smooth month for him.Ethan is very much looking forward to his birthday this month as he will be away on cub camp, a very special party indeed. Many thanks to everyone who has sent Ethan some mail, he just loves it. Ethan has had some wonderful gifts, including a whole box of pirate bits and bobs, a fan that has a display function and a book on the wonderful world. Many thanks! Ethan has had a good couple of months. He had his annual review which was all good except his weight; he really does need to put on a few pounds. Ethan is now on Calshakes which apparently taste like McDonalds milkshakes which he loves. Ethan has another appointment in May which hopefully will show a weight gain.Ethan would like to say thank you for all his post, and that he looks forward to coming home after school to see what has arrived. Ethan has not had a bad couple of months, he has had a course of antibiotics for a heavy cold which ended up on his chest, but thankfully his swabs came back clear.Ethan is still not putting on much weight and is still on his build up drinks which he is not keen on. He has his annual review next month which, fingers crossed, will go well. He is looking forward to the liver scan and chest x-ray but not the blood tests! Hopefully he can try some different drinks to help him gain weight. Ethan made it into the school cross country team this month after coming 4th in his year group. He ran a county school race, but unfortunately his team came second and didn’t make it into the finals. Ethan is doing very well at school as well, having completed a whole term without having a day off – something he has never achieved in any of his 4 years at school. Ethan loves receiving his post and is now taking an interest in sending post to other children, as the post makes him smile and he wants to make others smile as well. Thank you for Ethan’s post, he loves the Karate Bag!! Ethan has had a good month as his blood levels have gone down and his cough has eased. However, he is on another short course of steroids as he was starting to cough again. Ethan had a wonderful Christmas and unlike last year was hospital free. Thank you to everyone who sent cards and gifts for Ethan and Kezia, they were lovely. Ethan also really loved the letters from Jangles! Ethan has had a few up and downs this past couple of months, starting when he developed an infection from having his flu jab, he was not happy! Ethan has had a very strange cough and has had blood tests to determine the cause, he has had a course of steroids as some infection markers were up, and we are awaiting the results of a further blood test, hoping the markers have come down. Ethan is now on build up drinks as he is not eating as well as he should and his weight is dipping slightly, although he hates them we are persisting with them with the hope of him coming off them when we next see his consultants in 3 months time. Ethan had his swine flu injection and was a very good boy, holding his arm out nicely for the nurse, usually it takes 3 of us to pin him down! Ethan is very much looking forward to Christmas. A great big thank you to the person who sent him the letter from Santa Clause, he loved it so much that he took it into school and showed it to anyone who would look. Ethan loves his post! Fingers crossed we are not in hospital like we were over Christmas and the New Year last year. Ethan has had a varying couple of months. He has been up and down with his chest and he has had a few courses of oral antibiotics which have kept the worst at bay. Ethan has lost a little weight which his doctors are slightly concerned about, so we are feeding him with as much fat as possible. His next hospital appointment is not until November but we will have to get in touch with them over the next week or so as he is coughing a lot more and is quite tired, which is unusual for Ethan. Ethan had a good summer holidays but couldn’t wait to get back to school as he enjoys it so much. Now he is back thought he wants time off. Ethan also became a big brother to a little sister in September who he loves to pieces and takes really good care of, despite him feeling rough himself. Thank you to everyone who has sent cards, letters and gifts. Ethan loves to receive his post and looks out for it most days, I can’t thank Post Pals enough for making Ethan feel loved by people he has never met. Post Pals is fantastic and always brings a smile to Ethan’s face. Ethan has been keeping very well over the last few months. We have recently moved and he now has a much bigger and very grown up bedroom which he loves. Ethan has not had any courses of antibiotics or any problems apart from a little bit of hayfever.Unfortunatley, during the karate holiday, Ethan did not manage to gain his brown belt which he was dissapointed about, but he is continuing to work hard towards it! Ethan has also started his guitar lessons and is doing really well. He is not sure if he enjoys them or not so only time will tell if he sticks to them. Many thanks to all who have sent Ethan birthday cards and post. He loves receiving things through the post! Ethan has had a very good few months. He has been enjoying the sunshine and playing outside.His health has been excellent and two of his nebulisers have been cut out of his routine, which he is very happy about. Ethan now does his own physio using an accapella which he breathes through and it vibrates his chest, making him a very independent boy. This month Ethan is attending his Karate group’s camp on the Isle of White and he is hoping to gain his brown belt whilst there. He has been practicing like mad!Ethan has a routine hospital appointment this month and fingers crossed it will go smoothly as he is in good health and keeping well. First of all, sorry for the lack of updates as it has been a hectic few months. Ethan became quite poorly in the run up to Christmas and was not improving. He went in to hospital a couple of days after Christmas for a 2 week IV course of antibiotics. Whilst in hospital he managed to contract pseudomonas which put him in isolation. The IV antibiotics worked and Ethan came out of hospital the best he has been for months. Unfortunately over the last few days he has developed another cough so is on more oral antibiotics and more nebulised antibiotics. Ethan is now on 5 nebulisers a day which he is not keen on.Otherwise Ethan is well and he is enjoying school and keeping up with his karate. Most of all though, he is excited about becoming a big brother! Thank you for all the cards and gifts that were sent over Christmas. Ethan also loved his Valentine’s cards. Ethan has kept fairly well these past few months. He has had a few courses of antibiotics which have now seemed to have stopped his chesty cough. Ethan is keeping very active taking part in Karate and Beavers. He has now started swimming lessons at school which he enjoys. Ethan would like to thank everyone who has sent him mail; it really makes him a smile after a hard day. Special thanks to Julie B for your lovely notes and gifts. Also to Post Pals for the parcels, Ethan loved them. Post Pals is fantastic, thank you everyone! Ethan has had a varied few months. He was very poorly in May with an infection. He picked up in June and had a very good hospital visit, although this month he has unfortunately developed another cough and a bug in his lungs. This is being treated with a course of oral antibiotics which, fingers crossed, will prevent the need for another hospital stay. Ethan is still a purple tag in karate and is very near to getting his purple belt. Ethan is very excited about going back to school in September as he will be in the Junior part of the school. 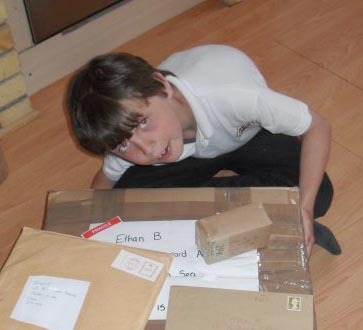 Post Pals is a fantastic site and thanks to everyone who sends Ethan mail, he eagerly awaits them arriving. Ethan attended his annual review in March and we had some good news and bad. The good is that Ethan has grown and put on weight. The bad is that unless his cough goes he will be going into hospital for 2 weeks. Ethan is now on a nebuliser which he hates and needs to have physio 3 times a day along with his other activities. Ethan also has crackles back on the base of his right lung and they took months to go last time. On a positive note, Ethan is now a purple tag in karate, even though he broke his little toe during a sparing match! Many thanks to Helen F, Ethan loves the socks so much he wears them every night! To Debi, the hat is lovely, thanks! Julie, thank you for your cards and the tongue-twister which had us all in fits of laughter!